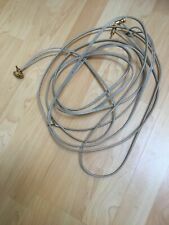 1.5m QED QUNEX SILVER REFERENCE AERIAL CABLE WITH MALE TO MALE CONNECTORS. Full Working Order.See Item Description Please. Total length included plugs 2.1 m QED GENESIS SILVER SPIRAL Speaker Cable - Factory AIRLOC Banana Plugs. QED Profile Silver 12; Speaker cable 2 x 2m terminated lengths. Condition is Used. Good quality speaker cable, by QED, I've used these for several years and they provided my speakers with an outstanding level of clarity. I no longer need them because I have sold my Hi Fi equipment due to an imminent move overseas. Dispatched with eBay delivery – Shutl 2-3 days. or Royal Mail First Class. QED Silver anniversary speaker cable 5M. Condition is Used. Dispatched with Royal Mail 1st Class. QED REFERENCE SILVER ANNIVERSARY XT 2 MT. LUNGHEZZA 2 MT. QED SILVER ANNIVERSARY XT SPECIFICS. QEDSILVER ANNIVERSARY XT. SILVER PLATED 99.999% OFC CONDUCTORS. Capacitance - 50pF/m. Loop resistance - 0.021 Ω/m. Cross-sectional area - 1.50mm². Jacket OD - 3.90mm. QED REFERENCE SILVER ANNIVERSARY XT 3 MT. LUNGHEZZA 3 MT. QED XT 40 SPECIFICS. For best results use QED Airloc™ Forte banana plugs. Dissipation factor - 0.0576. Inductance - 0.46 µH/m. Capacitance - 59pF/m. Loop resistance - 0.008 Ω/m. Cross-sectional area - 4.00mm². 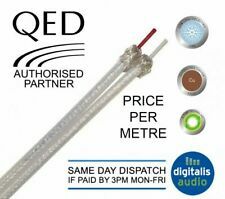 QED Silver Anniversary speaker cable 2.5M x2. Condition is Used. Dispatched with Royal Mail 1st Class. AIRLOC Forte Banana Plugs. 8 Airloc Forte banana plugs fitted. Option - Airloc Spade connectors. Award Winning Speaker Cable from QED. QED Silver Anniversary XT. The precise cylindrical construction of the silver-plated, 99.999% pure, oxygen free copper cables reduces the distortion caused by ‘skin effect’. The QED Silver Anniversary XT is a multi award winning cable, a natural replacement for the standard Silver Anniversary, giving even better performance at a low price. AIRLOC Forte Banana Plugs. The price quoted is for asingle length of QED Genesis cable fitted with Airloc connectors. Award Winning Cables from QED. QED GENESIS. QED GENESIS SIGNATURE SILVER SPIRAL isn't just another speaker cable, it is a high performance audio component! 4 x Deltron BFA Connectors. Award Winning Speaker Cable from QED. QED Silver Anniversary XT. The precise cylindrical construction of the silver-plated, 99.999% pure, oxygen free copper cables reduces the distortion caused by ‘skin effect’. 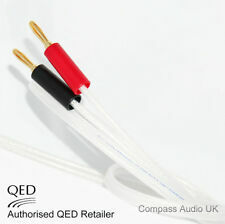 The cable used is the highly regarded QED Silver Anniversary XT speaker cable. See details below. Qed Silver Anniversary XT Speaker Cable Details If you would like a different combination of spades and bananas - just ask! 2 4 Airloc Forte. QED Award Winning Cables. One of the big problems as cable conductor size increases, is how to keep the inductance low. This is vital to reduce cable losses and prevent inaccuracies in the signal transfer process, i.e. distortion. Airloc Forte. QED Award Winning Cables. 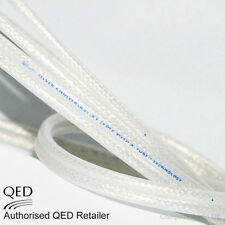 QED Performance Silver Micro cable brings you a miniature sized discreet cable that does not compromise on quality. QED Silver Micro cable listed is for connection to 2 speakers -. Reference Silver Anniversary XT. TM and conventional stranded/solid core speaker cables convey signals in a linear way. However, at high frequencies, X-Tube. Cuts down on the amount of audio signal energy lost due to cable capacitance. AIRLOC Forte Spades/Banana Plugs 20cm. Award Winning Cables from QED. QED GENESIS. QED GENESIS SIGNATURE SILVER SPIRAL isn't just another speaker cable, it is a high performance audio component! This award winning cable is the result of. 4 4 Airloc Forte. QED Award Winning Cables. QED Silver Anniversary XT Bi-Wire Speaker Cable. One of the big problems as cable conductor size increases, is how to keep the inductance low. This is vital to reduce cable losses and prevent inaccuracies in the signal transfer process, i.e. distortion. Used, perfectly working silver anniversary QED speaker cable 220cm High quality sound can only be achieved with high quality cable like this. Other lengths available, see other listings. Thanks. QED Award Winning Cables. 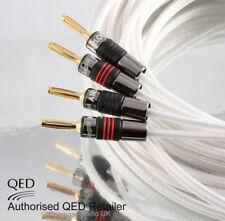 QED Performance Silver Micro cable brings you a miniature sized discreet cable that does not compromise on quality. Speaker Cable. Silver Micro. Loop resistance - 0.0249 Ω/m. AIRLOC Forte Banana Plugs. The price quoted is for one pair of QED Genesis cables fitted with 8 Airloc connectors. Award Winning Cables from QED. QED GENESIS. QED GENESIS SIGNATURE SILVER SPIRAL isn't just another speaker cable, it is a high performance audio component! 4 x AIRLOC Forte Plugs. Award Winning Speaker Cable from QED. QED Silver Anniversary XT. The precise cylindrical construction of the silver-plated, 99.999% pure, oxygen free copper cables reduces the distortion caused by ‘skin effect’. QED Silver Anniversary Speaker Cable 2x2M. Condition is Used. Dispatched with Royal Mail 1st Class. 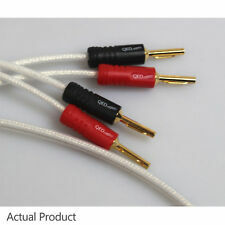 QED Genesis BiWire High performance speaker cable. Headphone Amplifiers. Genesis Silver Spiral Bi-Wire. This Bi-Wire version extends the already remarkable performance envelope of standard Genesis Silver Spiral by using Genesis Dual core technology in a compact quad core format. Airloc Forte. QED Award Winning Cables. 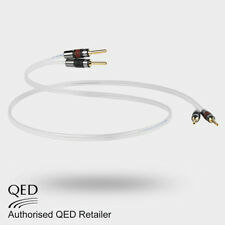 QED Performance Silver Micro cable brings you a miniature sized discreet cable that does not compromise on quality. QED Silver Micro cable listed is for connection to ONE speaker -. QED Reference Silver Anniversary XT Speaker Cable 3M AIRLOC. One of the biggest problems facing speaker cables is keeping the inductance low as cable conductor size increases. This is vital to reduce cable losses and prevent inaccuracies in the signal transfer process, i.e. distortion.